Joseph Beuys (May 12, 1921 – January 23, 1986) was a German conceptual artist, who produced work in a number of forms including sculpture, performance art, video art and installations. He was inspired by the ideas of Rudolf Steiner and the French artist Yves Klein. Beuys was an important teacher of famous neo-expressionist German artists as Jörg Immendorff, Walter Dahn, Anselm Kiefer and Blinky Palermo. Beuys held a lot of lectures in the U.S. Beuys enlarged the area of art to the whole life of mankind; everybody is an artist. 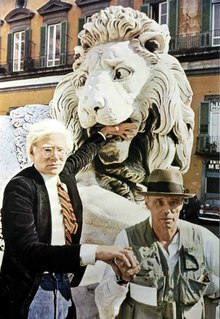 He introduced the notion of social sculpture. To be a teacher is my greatest work of art. The rest is the waste product, a demonstration. If you want to express yourself you must present something tangible. But after a while this has only the function of a historic document. Objects aren't very important any more. I want to get to the origin of matter, to the thought behind it. Art alone makes life possible – this is how radically I should like to formulate it. I would say that without art man is inconceivable in physiological terms. Even the act of peeling a potato can be an artistic act if it is consciously done. my art cannot be understood primarily by thinking. My art touches people who are in tune with my mode of thinking. But it is clear that people cannot understand my art by intellectual processes alone, because no art can be experienced in that way. 'Fat' traverses the path from a chaotically dispersed, undirected energy form to a form. Then it appears in the famous fat corner.. ..now [a wedge of fat in the angle between seat and back of the wooden old Chair, Beuys used in the fat-sculpture, like 'Stuhl mit Fett' (Fet Chair), 1964] intersects the human body in the region that houses certain emotional forces [Beuys laughed, and so did everyone else of the public]. Creativity is not limited to people practising one of the traditional forms of art, and even in the case of artists, creativity is not confined to the exercise of their art. Each one of us has a creative potential, which is hidden by competitiveness and success-aggression. To recognize, explore and develop this potential is the task of the School. Creation – whether it be a painting, sculpture, symphony or novel – involves not merely talent, intuition, powers of imagination and application, but also the ability to shape material that could be expanded to other socially relevant spheres. It is a special kind of secret how these Asiatic elements [of American Indians] came over the Bering Strait long ago. It's the same with the coyote. When I worked with the coyote [this quote refers to the performance by Beuys when he was locked up together with a coyote in a cage for a few days in René Block Gallery, New York City in 1974], I had the idea that it was not an indigenous animal. It came as a wolf with the Indians over the Bering Strait. And this Asiatic wolf, or step wolf, changed his whole biological configuration and behavior. Then it was my idea to import the coyote once more back to Europe, and you could see it [the coyote] change back to the European wolf or Siberian wolf. It is a transformed European wolf, the coyote, how it came to the character of a brush wolf. For instance the idea of intuition, imagination, inspiration.. ..is related in the principle to an invisible world.. ..when I call these drawings 'The Secret Block' then I try to stress this part of reality as the most important part because spiritual existence is firstly.. .I find if we are only confronted with this hard part of the world, this already done part of the world, we are not.. ..related to the whole idea of reality.. ..the mission of the art is to make visible the whole reality.. I try to go further on over the threshold where modern art ends and anthropological art has to start. I am interested in the creativity of the criminal attitude because I recognize in it the existence of a special condition of crazy creativity. A creativity without morals fired only by the energy of freedom and the rejection of all codes and laws. For freedom rejects the dictated roles of the law and of the imposed order and for this reason is isolated. My objects are to be seen as stimulants for the transformation of the idea of sculpture.. ..or of art in general. They should provoke thoughts about what sculpture can be and how the concept of sculpting can be extended to the invisible materials used by everyone. Sculpture as an evolutionary process; everyone an artist. That is why nature of my sculpture is not fixes and finished. Processes continue in most of them: chemical reactions, fermentations, color changes, delays, drying up. Everything is in a STATE of CHANGE. QUESTION: A well-known saying of yours asserts that 'Every man is an artist.' If every man is an artist, then why have art academies and art professors at all? 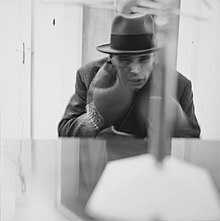 BEUYS: To be sure, 'every man is an artist' in a general sense: one must be an artist for example, to create self-determination. But at a certain stage in his life every man becomes a specialist in a certain way; one studies chemistry, another sculpture or painting, a third becomes doctor, and so on. For this reason we understandably need special schools. It is a kind of vehicle, you know. It's a kind of making, spreading out ideas, that is what I think. It spreads out the idea. You must care for information and I personally try to make information available not only in a written way.. .I try also to work with images, with fantasy, with jokes, with humor. It accelerates the discussion of the problem of a new society.. ..so I work coming from the idea of art as the most important means to transform the society. For me it is the WORD that produces all images. It is the key sign for all processes of moulding and organizing. When I use language, I try to induce the impulses of this power.. ..the power of evolution. But language is not to be understood simply in terms of speech and words. That is our current, drastically reduced, understanding of language.. .Beyond language as verbalization lies a world of sound and form impulses, a language of primary sound without semantic content, but laden with completely different levels of information. Yes, now we are at the starting-point again. Now we are at our real issue: that we understand ourselves first as sites of education, for information for democracy, for tree-part structure, and so on. We have to ensure that it is structured organically, so that it functions like a person functions internally, like the organs function.. .First in the examination of the matter. Secondly in that one develops a concept of.. ..a social order that have never existed before. That simply means: to realize freedom, democracy and socialism – free democratic socialism. For example, when we leave [The Documenta in] Kassel, a working group or maybe two working groups will work on things here at Kassel. We want to cause a snow-ball effect. We want to build a network throughout Europe that will work on these things, right? I can only say: we can only do it as well as possible. School is universal. That means, on the street – when you talk about these things with people at the grocer's; the school is at the grocer's at that moment. I just want to encourage everyone to take this into their own hands, the educational process.. .We don't need a brilliant talent somewhere. Precisely the ability that one has at the moment must be put to work. I go to the typical state school and try to infiltrate it. Yes!.. .One can do something in the institutions in trying to infiltrate them, and outside one can do something to set a model in place.. .One must work with divers methods anyway. One must always carry on with what is possible. Only on condition of a radical widening of definitions will it be possible for art and activities related to art [to] provide evidence that art is now the only evolutionary-revolutionary power. Only art is capable of dismantling the repressive effects of a senile social system that continues to totter along the death-line: to dismantle in order to build 'A SOCIAL ORGANISM AS A WORK OF ART'. This most modern art discipline - Social Sculpture / Social Architecture - will only reach fruition when every living person becomes a creator, a sculptor, or architect of the social organism. learns to determine the other positions in the TOTAL ARTWORK OF THE FUTURE SOCIAL ORDER! I think art is the only political power, the only revolutionary power, the only evolutionary power, the only power to free humankind form all repression. I say not that art has already realized this, on the contrary, and because it has not, it has to be developed as a weapon, at first there are radical levels, then you can speak about special details. Quoted in: Robert C. Morgan (1978). The Role of Documentation in Conceptual Art: : An Aesthetic Inquiry. p. 176. I was invited to come here to speak about my idea of art, which is to enlarge the effectivity of art beyond the idea of art as coming out of art history — an art idea which contains the well-known disciplines like sculpture, architecture, painting, music, dancing, poetry and so on. I would like to declare why I feel that it's now necessary to establish a new kind of art, able to show the problems of the whole society, of every living being — and how this new discipline — which I call social sculpture — can realize the future of humankind. It could be a guarantee for the evolution of the earth as a planet, establish conditions for other planetarians too, and you can control it with your own thinking. Art is the only power to free humankind from all repression. Here my idea is to declare that art is the only possibility for evolution, the only possibility to change the situation in the world. But then you have to enlarge the idea of art to include the whole creativity. And if you do that, it follows logically that every living being is an artist – an artist in the sense that he can develop his own capacity. And therefore it's necessary at first that society cares about the educational system, that equality of opportunity for self-realization is guaranteed. The outward appearance of every object I make is the equivalent of some aspect of inner human life.. .My feelings then had this special kind of darkness – almost black like this mixture of rubber and tar. It is certainly an equivalent of the pathological state mentioned before, and expresses the need to create a space in the mind from which all disturbances were moved: an empty insulated space. My first concert - apart from Beethoven at School and Erik Satie at the opening of my exhibition in Kleve in 1960 - was at the gallery Parnass in Wuppertal in 1963. Dressed like a regular pianist in dark grey flannel, black tie and no hat, I played the piano all over – not just the keys – with many pairs of old shoes until it disintegrated. My intention was neither destructive nor nihilistic. 'Heal like with like' – similia similibus curantur – in the homeopathic sense. The main intention was to indicate a new beginning.. ..or simply a revolutionary act. This was my first public Fluxus appearance. Quoted in: Joseph Beuys, Carin Kuoni. Joseph Beuys in America: Energy Plan for the Western Man. New York, 1993, p. 128; Comment on his first Fluxus performance in 1963 'Heal like with like'. I don't know what they call mysticism, it is in truth perhaps the interest of the spirit; that the work expresses the spirit, and not the formal aspect. While in the United States a lot of art production runs along the line of formalist art; what one could call the post-modernism, a kind of formalist intention like Don Judd, Carl Andre, Robert Morris, and these. People who say: 'Ah, this Beuys will go back to the middle ages, or to the stone dwellers, cliff dwellers.' No, there is a misunderstanding. I have nothing against the materialistic methodology of analytics, but I think we have to enlarge this thing, not to get caught in a very restricted one-sidedness in our way of looking towards life. Because the problems of life, soul, humankind's spirit, the problems of intuition, imagination, and inspiration, the problems of birth and death, the problems of survival in a bigger shape, and to bring in the image of the meaning of man. I wished to go completely outside and to make a symbolic start for my enterprise of regenerating the life of human kind within the body of society and to prepare a positive future in this context... I can see such a use for the future as representing the really progressive character of the idea of understanding art when it is related to the life of humankind within the social body in the future. I believe that planting these oaks is necessary not only in biospheric terms, that is to say, in the context of matter and ecology, but in that it will raise ecological consciousness-raise it increasingly, in the course of the years to come, because we shall never stop planting. Quote of Joseph Beuys (1982), as cited in: Land and environmental art, Jeffrey Kastner, ‎Brian Wallis (1998), p. 164 - about his 7.000 Oaks [see there the image]. I think the tree is an element of regeneration which in itself is a concept of time. The oak is especially so because it is a slowly growing tree with a kind of really solid heartwood. It has always been a form of sculpture, a symbol for this planet. Let's finally try to talk about a system that transforms all the social organism into a work of art, in which the entire process of work is included, whether it's work by Francisco Goya or Kounellis or mine, as well as agriculture, the sciences, or education or technology, something in which the principle of production and consumption really takes on a form of quality. One must not only transform the creation of paintings or sculptures, but the entire social form. It's a gigantic program. This is why we believe that a well-ordered idea of ecology and professionalism can stem only from art – art in the sense of the sole, revolutionary force, capable of transforming the earth, humanity, the social order etc.. ..Art is, then, a genuinely human medium for revolutionary change in the sense of completing the transformation from a sick world to a healthy one. In my opinion only art is capable of doing it. The idea of creativity is for me the problem of the future. Since the creative power is not a simple thing. It has a rich structure. It is divided into a lot of different principles and represented by figures, and these figures you can also write down in a kind of symbolic mantra. It is important to work on every point of creativity and see how the human being stands in the energy that comes out from the surrounding world. In discussing his work [the art of Marcel Duchamp, ] it is necessary to avoid overrating his silence. I hold him in a very high esteem, but I have to reject his silence. Duchamp was simply finished. He had run out of ideas; he was unable to come up with anything important.. .I would say that even the bourgeois tendencies in Duchamp's work – i.e., a form of provocative, bohemian behavior intended to 'épater le bourgeois'- follow the same path. Duchamp started out from here and wanted to shock the bourgeoisie, and because of that he destroyed his creative powers.. .The content of Duchamp's silence refers to the aim of leaving the subconscious passive, of developing it. This is the aspect of Duchamp, which is related to Surrealism. The surrealists asserted that they could live with their subconscious; they thought they were above reality, but instead they were beneath it. They thought they could fish in muddy waters.. ..but to my mind, the images which emerged have a repressive effect. I had the feeling that another kind of life -- perhaps in a transcendental area -- would give me a better possibility to influence, or to work, or to act within this contradiction. So, this was my general feeling: on the one side, this beautiful undamaged nature form which I took a lot and had a lot of possibilities for contemplation, meditation, research, collecting things, making a kind of system; and on the other side, this social debacle that I felt already as a coming dilemma. But I saw the relationship between people, I saw their thoughts, I saw their kind of expressionistic behavior in every difficult situation. I saw all the time the unclearness in the psychological condition of the people. You know, that was the time called the 'Roaring Twenties' and I felt that this expressionistic behavior, this unformed quality of soul power and emotion of life.. .I saw it, that it would lead to a kind of catastrophe. That was my general feeling. Directly after the interviews his holiness the 14th Dalai Lama of Tibet had given me [Louwrien Wijers] in Dharamsala, I enthusiastically informed Joseph Beuys how struck I was by the similarity in the viewpoint of His Holiness the Dalai Lama and the ideas that he himself had been working towards in his 'Social Sculpture' for the last fifteen years. I was able to come to this conclusion because my questions in the first interview with his Holiness had for a large part been inspired by the subjects Joseph Beuys had put to discussion first through his 'Organisation for a Direct Democracy', and then through his 'Free international University,' the ecological 'Green movement' and the political party 'The Greens'. The immediate reply from Joseph Beuys to my remark was that 'he would very much want to set up a permanent co-operation with His Holiness the Dalai Lama'. To the request whether a meeting could be arranged for Joseph Beuys with His Holiness the Dalai Lama a positive answer was received from the Office of His Holiness the Dalai Lama. To prepare the ground thoroughly for a fruitful audience with his holiness the Dalai Lama, '27' she arranged for Beuys to meet Lama Sogyal Rinpoche in Paris on January 29, 1982. He [the Dalai Lama] asked me for my participation and I rejected the plan to make a kind of sculpture there in this old way, to make in a kind of special place this special modern sculpture. I told him that my idea would be this time to plant seven thousand oaks in Kassel, seven thousand trees. And to mark every tree with a little stone, so that everybody after three, two, five or six hundred years can still see that in 1982 there was an activity. After the radical destruction of the forests here in Germany for all this technological nonsense, that there was an impulse that came in the same time, to plant seven thousand oaks. This is such a kind of activity during the Documenta [in Kassel] , that has to do with the 'Documenta', but is a real other thing in the conventional understanding of art. I think he [ Andy Warhol ] would be very interested in the moment that the Dalai Lama appears, being involved in such a kind of idea. Andy has always difficulties with this kind of political activities, because he works in another kind of world, but he is always.. .Also when he was here [in Germany] last week, he is very interested to hear a lot of new information. He has a kind of observing sense in the back of his mind. So, he is always interested to follow the development, and there is really a kind of imaginative process going on, I think. My intention: healthy chaos, healthy amorphousness in a known medium which consciously warmed a cold, torpid form from the past, a convention of society, and which makes possible future forms. This is precisely what the shaman does in order to bring about change and development: his nature is therapeutic. He [ Marcel Duchamp ] entered this object [the 'Urinal' ready-made] into the museum and noticed that its transportation from one place to another made it into art. But he failed to draw the clear and simple conclusion that every man is an artist. People are very shortsighted when they argue that way, when they say: Beuys makes everything with felt, so he's trying to say something about the concentration camps [of the German Nazi regime]. Nobody bothers to ask whether I might not be more interested in evoking a very colorful world as an anti-image inside people with the help of this element, felt. So it's a matter of evoking a lucid world, a clear, lucid, perhaps transcendentally spiritual world through something which looks quite different, through an anti-image. 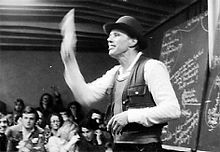 Beuys complained that the [art] teachers didn't exhibit [during the winter semester's Open Week, 1964] any of their own works. He then brought along an old kitchen chair and a large quantity of margarine and patted the margarine on the seat of the chair with a wooden paddle so that it sloped like a wedge. We [students of Düsseldorf Art Academy, 1964] saw nothing unusual in this and none of us realized that we had before us a incunabulum of art. At that time Beuys had told us nothing about his 'energy-concept' or the like. We simply considered the making of this 'Fat Chair' to be a rather unspectacular action. Once again the lack of a convenient language makes for the creation of a series of separate versions or myths, and it is this difficulty of precise description or discussion that leads to the 'Beuys cult'. His actions do have the quality of myths, the same invisible logic as a myth and one must, I think, accept the performance as it stands rather than inquiry into its origins. 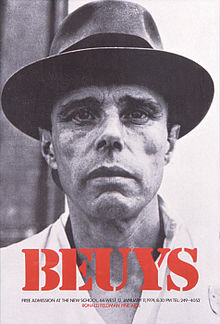 I mean artists like Joseph Beuys, who is really a tough, strong artist. B E U Y S. He's been working in Germany for years. He doesn't bother with the burden of ideas. What he desires to do is fill your house with margarine. Let you live encased in fat, die encased in fat. He would take three hundred pounds of margarine and put it exactly where Pat Kelly is now, and then leave it there. That's sort of the tenor of his work. The milieu in which creativity can be developed is principally the field of culture, and Beuys starts his sociopolitical program in the area of culture, in order to develop from this special angle the concept of equality as well as of democracy and socialism as a genetic process. The intellectual life, which education must should be structured, stands most definitely at the beginning of this evolutionary process of development. Next to it is equality as the democratic principle of law, meaning concrete socialism and fraternity in relation to the economic area. Within these three areas there is no qualitative ranking system. 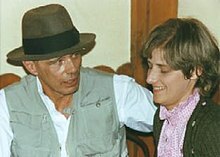 The primary necessity in Beuys' concept of direct democracy is freedom, meaning that every man should be able to completely realize his liberty, for example, his right to a free and equal unfolding of his personality, as is firmly established as a fundamental law in the organization's statutes. Unlike his European peers from the late 1950's — Piero Manzoni, Arnian, or even Yves Klein — Beuys does not change the state of the object with the discourse itself. Quite to the contrary, he dilutes and dissolves the conceptual precision of Marcel Duchamp's readymade by reintegrating the object into the most traditional context of literary and referential representation: this object stands for that idea, and that idea is represented in this object. The Fluxus movement.. ..developed its 'anti-art', anti-commercial aesthetics under the leadership of George Maciunas. Fluxus staged a series of festivals in Paris, Copenhagen, Amsterdam, London and New York, with avantgarde performances often spilling out into the street. Most of the experimental artists of the period, including Joseph Beuys, Yoko Ono and w:Nam June PaikNam June Paik, took part in Fluxus events. The movement, which still continues, played an important role in the opening up of definitions of what art can be. Anon. 'Nam June Paik: Section 2: Fluxus, Performance, Participation', Tate Online, n.d. Considering that Beuys was born in a small German town called Kleve and I was born in another small German town called Bad Oldesloe, I believe that even an airport can be an inspiring place for an artist. This page was last edited on 28 March 2019, at 12:33.